Stuck in gridlocked traffic trying to reach the Lions Gate Bridge, I ask myself why I’ve spent money and driven two-plus hours to witness what I’ve presumably seen several times on YouTube already. My girlfriend, Nina, a tagalong for the evening, wonders the same. What could Jordan Peterson possibly say on this occasion that I haven’t encountered in his book and numerous video appearances? Nothing, I assume, but I’m interested in witnessing the Jordan Peterson experience firsthand. What will the energy in the room be? When I look around, what sort of people will I see? Will it be tense? Cultish? Riotous? Will the scene before me confirm the worst suspicions of his opponents, a sinister rhetorician inciting reactionary males to tyrannical behaviour? Or will it be warm and motivational, a benevolent lecturer urging his listeners to take responsibility amidst our chaotic and unpredictable lives? 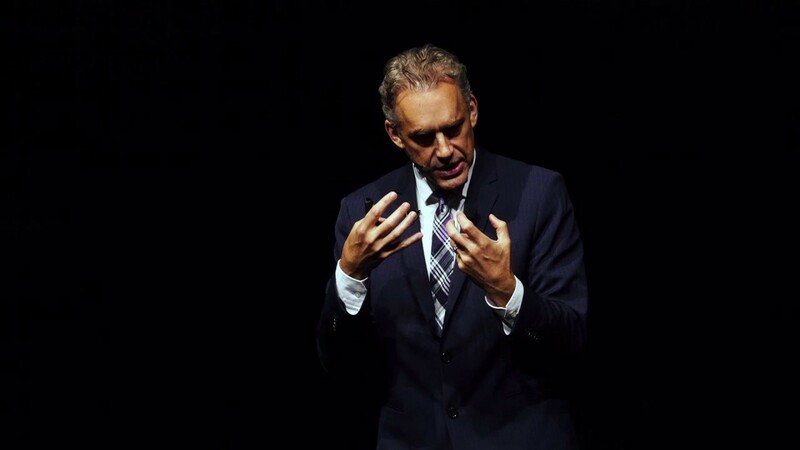 It’s the last stop of Peterson’s “12 Rules for Life” tour in 2018, at the Queen Elizabeth Theatre in Vancouver. After a tedious drive, our spirits are lifted by good food and beer at a restaurant near the venue. We saunter to the theatre 20 minutes before showtime, arriving to find the ornate lobby packed with well-dressed people. Our first impressions: This is fancier than expected. We’re underdressed. Attendees sip on coffees and cocktails, conversing cheerfully and glancing around at intervals to see if others are venturing into the theatre. As showtime nears, there is a steady procession to the men’s bathroom. At five-to, show goers fill the theatre without instruction. We find our seats and a large, friendly man to our left introduces himself as Dave. Every time we have to stand for others to reach their seats, we’re met with a chorus of “sorry, sorry, sorry.” So far, it’s a courteous affair. From our seats, Nina and I greedily observe our surroundings. The audience is slightly older, more diverse, and more affluent than I’d imagined; maybe 70% male, 70% white, average age 30-40, fashion styles ranging from grad student to luxury gala. In addition to the supportive tagalongs you’d expect, many attending females come in the form of friend groups and mother-daughter duos. Laughter. The presence of hecklers seems unlikely. It’s been dark since 4:30 on this cold Wednesday night. The room emits sleepy enthusiasm, excitement for the show mingled with exhaustion. Rubin reflects on the year past. Traveling with Peterson has made him a better person. The rise of the “Intellectual Dark Web” proves we can put aside our differences for the pursuit of truth and reason. Heavy applause to mentions of Sam Harris and Ben Shapiro — our soldiers fighting the good fight — and to criticisms of the enemy, those deranged leftists who’d reduce the system to anarchy if not for our intervention. My cult-vibe sense tingles. How much of tonight will be spent denouncing the evils of the left? I understand Peterson’s role as a political antagonist but I’m put off by fanatics on the web who love to watch Peterson OWN/DESTROY/DISMANTLE leftist reporters, seemingly oblivious to the insane hypocrisy of denouncing tribalism while participating in an aggressive us vs. them culture. A big reason I’ve come tonight, I realize, is to confirm that Peterson’s core audience is not these people. Peterson walks out to tremendous applause and fumbles endearingly through his introduction, in his struggling-to-harness-all-this-brilliance way. He’s visibly at home in this setting, having spent his adult life lecturing and becoming a master at it. I’m transported to my university years, remembering fondly the few occasions when lectures were captivating. It would have been really cool, I think, to have had Peterson as a professor. He tells us he’ll use the evening to “think on his feet and work through some ideas.” Being the last tour stop of the year, he thinks it suitable to summarize the 12 rules and proceeds to do so quickly, before returning to rule number one for a deeper analysis. Stand up straight with your shoulders back. Rule number one, he reminds us, is the one most criticized by his opponents. Yet what kind of lunatic could disagree? Hierarchies are ubiquitous with life. And, as evidenced by lobsters, our primitive neurological relatives, these hierarchies matter — so much so that our position in them influences our brain chemistry. Furthermore, our closer neurological relatives in the primate kingdom teach us that brutish violence is a poor strategy for rising within complex social hierarchies. Cooperation and usefulness, it turns out, are the best approach. Strength is paramount but so is reciprocity. Like Peterson, I’m surprised by the criticism of this chapter. He’s referencing zoology and neuroscience to encourage us to be strong, helpful, and cooperative. Being a bully, he makes it clear, is not just morally wrong but also a poor strategy for success. It’s a staggeringly positive revelation. In his efforts to share his exasperation, Peterson spends a long time on this rule. Summaries of rules two, three, and four. Treat yourself like someone you are responsible for helping, Make friends with people who want the best for you, and Compare yourself to who you were yesterday, not to who someone else is today. He probably won’t finish all 12, I think, but if he does we’re going to be here all night. I hope that’s not the case because my legs are restless and we’ve got a long drive ahead, as well as a precarious time limit on the parking meter outside. Rule five. Do not let your children do anything that makes you dislike them. Peterson had thought people would take issue with this rule. Dislikable children, apparently, are not a polarizing topic. It seems he won’t have time for all 12, he tells us (phew), and number six is a good rule to finish with. Set your house in perfect order before you criticize the world. Rule six, in my opinion, represents the crux of Peterson’s ideology and explains his tentative position on the political right. In Peterson’s universe, the collective good occurs when individuals take responsibility for themselves, and then for a few others, and then for as many others as they have the means to support. Hierarchies are vital because the potential to rise in hierarchies motivates people to adopt responsibility. Prohibitive and egalitarian measures fight the collective good by limiting the growth of the most competent people who account for disproportionate production and innovation within society. This is the intoxicating promise of conservatism. We don’t need to concern ourselves with myriad sociopolitical complexities to be good citizens. We might be destined to fix the world but certainly not until we’ve fixed what’s within reach of our own two hands, and it may be the very act of doing so that catalyzes our rise in society. When the best people rise to the top through ingenuity and work ethic, we all win. It’s an appealing narrative that Peterson is especially skilled at articulating. My guess is that, more than any other element of his platform, Peterson’s followers adhere to this notion of self-sufficiency. If this is true, what follows is the assumption that Peterson’s followers are largely situated on the political right. Despite the evidence for this, including frequent criticisms of the left by Peterson and his supporters, I’d argue that the majority of Peterson’s followers exist in a growing political space — the conflicted centre. To understand why this might be true, we have to visit the liberal idea confronted by rule six. Rule six tells us to put our house in order before we criticize the world, to which liberalism replies, woah woah woah, it’s not that simple. If everybody is left to put their houses in order, the greedy and opportunistic will scoop up all the resources, building mansions and leaving the disadvantaged in shoddy huts or homeless. Such a scenario is antithetical to the collective good, which occurs when competition is regulated to produce the fewest losers. Regulation can be imposed by the government, through legislation, or by the public, through collective action or inaction. Both scenarios require advocacy and awareness. Therefore, we must be relentlessly vocal about our best interests. The houses will be put in order but only after we’ve ensured adequate housing for everybody. This is the intoxicating promise of liberalism. We can fix the world by making our voices heard. One issue at a time, we can piece together our utopia by speaking up for what’s right. Consequently, if unfortunate circumstances cast us to the bottom rung of society, we know we’ll be taken care of. There are more and better ways to explain these ideas but let’s concede that both have merit and it’s not obvious which is better. Historically, conservatism and liberalism are both disastrous when left unchecked. The genius of Western democracy is locking the two in a dialectic in which our task isn’t to choose one over the other but to disagree so thoroughly that we arrive at a mutually beneficial centre. That said, it’s not my experience that people choose their political views by analyzing these philosophical foundations. In my lifetime, politics have been topical. If you support the right to carry guns, you’re on the right. If you support gay marriage, you’re on the left. Anti-abortion — right. Pro-abortion — left. Private healthcare — right. Public healthcare — left. Etc. As a middle-class millennial Canadian with a liberal arts degree, I’ve traditionally steered left. In the cultural atmosphere of my upbringing, left-wing politics were the only choice for a compassionate, enlightened individual. My leftism was bolstered greatly at university where we learned about corporate hegemony and all the atrocities present in a system governed by the profit motive. I understand the stigma of liberal elitism because I’ve participated in it. Corporations, we were taught, had corrupted society and tricked the sheepish herd into acting against its own interest, but we the enlightened class could use our superior knowledge to reframe the narrative and restore power to the people. We just needed to make our voices heard, we were told, and social media offered a novel opportunity to do so. That was the early 2010s and what’s happened since then, I think, is surprising to everybody. For most of the past century, the only sociopolitical commentary published by ordinary people was in the “Letters to the editor” section of the newspaper. These opinions were curated and printed alongside the opinions of a few columnists in a bundle of paper that was delivered to your house daily. You could ingest all of it along with your morning coffee. If all the opinions published today were printed on paper and delivered to your house, you’d be physically buried within hours. It’s overwhelming. There are so many things we’re told to care about — some corporation we’re supposed to boycott, some celebrity we’re supposed to shun, some cause we’re supposed to support, some word we’re not supposed to say—it becomes difficult to engage. There’s too much noise. Amongst the noise, we see the best and worst of people. Prior to the 2010s, I’d argue the worst of the right was more visible than the worst of the left. All you had to do was flip on Fox News and endure a minute of inane bigotry to conclude yeah, that’s not for me. Insufferable progressives and the terror of communism were wrapped up in a previous chapter of history, leaving the left with a mostly credible public image. Global warming was a defining issue because it framed the left as science-positive and the right as science deniers. Now, we see liberal activists so hellbent on gender equality they’re willing to deny biological differences between the sexes. We see vitriol and a blatant thirst for power poorly concealed as compassion for the disadvantaged. We see overt racism and sexism paraded as progressive viewpoints. We see a culture promising to boost people up but focusing on tearing people down. We see these negatives not because they define the left but because the minority who embody them understand the power of narrative and are skilled and opportunistic at making their voices heard. However, public perception of the left is affected all the same. Enter Jordan Peterson and the point I’m trying to make. When the Web 2.0 shone its spotlight on society, it revealed idiocy and malice on both ends of the political spectrum. When the 2016 presidential election culminated with two of the most detested candidates in history, it revealed discontentment with the entire political system. People live and vote according to their values and people who value intelligence and rationality — ie. those who would prefer to choose between political candidates who can reasonably be expected to tell the truth — were left feeling alienated by both sides. With his impressive academic resume, his austere manner, his insistence on science and history as facilitators of opinion, and his ability to bluntly deliver complex ideas, Peterson appeals to these people. His popularity, he’s the first to admit, is the result of the right message being delivered in the right format, at the right time, and on the right platform. When Peterson and the cultural movement he’s associated with, labelled the Intellectual Dark Web (IDW), gained rapid popularity, it wasn’t because of any particular stance but because he and others such as Joe Rogan and Ben Shapiro communicate with their audiences the way you’d communicate with an intelligent adult — a stark departure from the ideological spoon-feeding we’ve endured from decades of politicians and prominent news figures. There’s no shortage of political views in the IDW but these views are held secondary to our freedom to discuss them. By ordering our priorities in this way, we feel confident that we’re making an intelligent decision whichever party we side with come election time. When the modern zeitgeist’s plethora of discontentment is contrasted with Jordan Peterson’s message of stop complaining and put your life in order, his is the more attractive proposition to many of us. We don’t realize we’re aligning with conservative ideology. We just want to feel smart and in control of our lives, separate from the whining, inconsolable mob. You can see it at his show, the same way progressives engage in virtue signalling, people clapping exuberantly for Peterson’s most eloquent and complex points as if to say look, I’m smart/I understand/I belong here. Peterson’s cautions of socialism and identity politics certainly influence some of his followers to take a devout anti-left stance, but I think these are a small-but-vocal minority, just like those they oppose. In the question and answer section, there is massive applause when Peterson is asked when he’ll run for Prime Minister. He’s similarly applauded when he says he’s consulting with both republican and democratic American politicians about tailoring their messages to alienated voters. I doubt that a politically biased audience would endorse their champion lending his expertise to both parties. I doubt that a politically biased expert would want to aid both parties. Based on this and everything I’ve written above, I’m left to assume that the dominant political position in the room is something like: I don’t care what side you’re on, if you speak to me like I’m intelligent and tell me how to add value to society, you have my attention. If the generic criticisms of Peterson are accurate, when I look around at his show, I should see a homogenous crowd of white males. Peterson should be reminding us of our evolutionary purity. He should be demonizing non-males and non-whites and urging us to uphold our white male dominance for the good of humanity. Seriously, if you label him a “darling of the alt-right,” as has become the default stance for Peterson opponents, this is what you’re suggesting. If somebody is a Nazi, you’d expect them to act like one. Instead, I look around and see a diverse crowd listening intently to a scholarly man who urges us to tell the truth, show kindness to strangers, be humble in our knowledge, and to take responsibility for ourselves and those we care about, among other “rules” for a meaningful life. I don’t feel compelled to defend Peterson because the live show was incredible, but because it was mellow. It was a calm and cheerful experience. After seeing him in person, I’m more perplexed than ever at the persistent attempts to label him as dangerous. Such claims are so obviously false it leaves you to wonder about the agendas of the people making them. By no means do you need to be a fan but if you find yourself obsessing over ways to discredit him instead of simply paying attention to someone else, maybe it’s because his message holds an uncomfortable truth that you’re not willing to deal with.